Blizzard has announced the latest addition to Heroes of the Storm and it may not be what you were expecting. Speculation has run wild in recent weeks over who the new addition to the Nexus could be, with many surmising that it could only be Overwatch’s ultra-cool hacker Sombra. 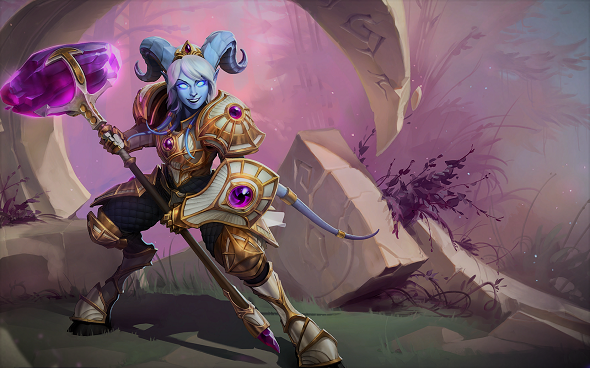 However, these theories have been dashed as, after much fan demand, Blizzard is bringing World of Warcraft’s Yrel into the Heroes of the Storm universe alongside a new battleground and event, adding a plethora of new content to the MOBA. You can never have too many MOBAS. Here are our definitive best MOBAs. Yrel is a Draenei paladin who hails from the Warlords of Draenor storyline. 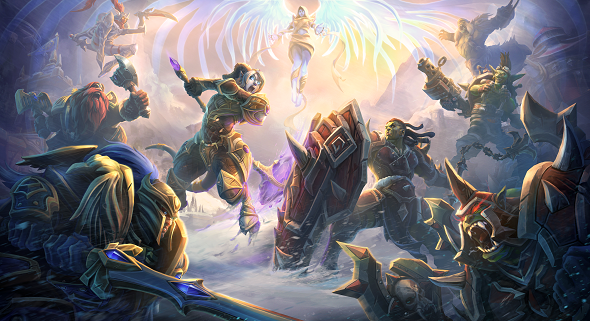 Her new Heroes of the Storm form is one of the most diverse combatants we have seen in the Nexus thus far, adding several new dimensions to the flow of battle. Meanwhile, the new map, Alterac Pass, adds new objectives to make games more nuanced than ever before. We caught up with Blizzard to get the lowdown on all the new content heading to Heroes of the Storm. The newest wave of Heroes of the Storm content, which includes new skins, mounts, sprays, and other cosmetics, is going live this summer, with an exact date to be clarified. Overview: A deliberate melee warrior whose heavyweight abilities reward premeditation and commitment. The next hero from the WoW universe heading to the Nexus is Yrel. WoW players will no doubt recall Yrel as one of the major characters from Warlords of Draenor, starting as a lowly temple acolyte and rising up to lead her people and fight on behalf of the Alliance. Yrel is a paladin and boasts various unique abilities that position her as a tank that can absorb damage for your team, using melee skills for crowd control. All of Yrel’s abilities can be charged up for greater effectiveness, lending a rhythmic, wind-up quality to her playstyle. Her basic ability, Vindication, allows you to unleash holy energy to damage enemies around you, while also keeping Yrel protected. Righteous Hammer lets you damage and knock enemies back simultaneously. Get this move up to max charge to stun the enemy. Avenging Wrath leaps to an enemy and slows any others nearby. Charge up this ability to increase range and drive back your opponents. All of these abilities are bolstered by Yrel’s trait, Divine Purpose, which, when activated, allows the warrior to instantly charge her next ability at no mana cost. As a passive boost, Yrel’s abilities charge up over 1.5 seconds, increasing in effectiveness but reducing movement speed by 25%. Use this unique bonus to your advantage to achieve the best results with Yrel, but be careful when charging a move as this can be interrupted by stuns. Finally, we have Yrel’s heroic abilities. Ardent Defender surrounds Yrel in a barrier for three seconds, absorbing all damage taken and healing her for 50% of the damage received. Sacred Ground sanctifies the ground around Yrel, gaining 40 armour until she leaves the area. All of these abilities will be key to surviving in Alterac. The iconic valley of Alterac is coming to the Nexus with this new three-lane battleground. 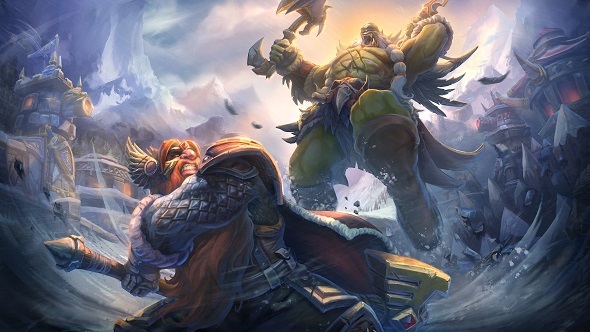 Blizzard stressed that its goal was to make this battleground feel like WoW and structured it in such a way that would reflect its themes and gameplay. Alliance forces will attack from the left, while Horde forces will, predictably, charge from the right. The focus of this map will be the generals on each side which act as bosses to be destroyed by the attacking team. These formidable opponents take the place of structural cores on this battleground. Gather your squad and square up to General Vandar Stormpike for the Alliance and General Drekthar of the Frostwolf clan for the Horde. Both will charge at incoming challengers and follow-up with a whirlwind ability. Retreat and they will do the same – regenerating health as they go. You can also weaken the general’s armour by destroying keeps. Prisoners will periodically spawn within enemy camps to add a little spice to the flow of battle. You’ll be charged with freeing them if you want to reap the objective reward. Taking the objective will spawn a cavalry unit in each lane. These mounted units will push into enemy territory, granting you a damage and speed-boosting aura in the process. In keeping with the WoW theme, Nexus Grave Golem bosses will also get a new spin, appearing on Alterac Pass as Mountain Giants. There are new Keep mechanics for this map as well. Destroying a keep will now spawn tanky melee reaver minions that serve to halt attacking forces. Rallying behind your cavalry forces looks to be the best way to secure victory on Alterac Pass. The buffs provide the main part of the cavalry’s pushing power and are key to taking down the generals. Due to their health regenerating abilities, an all-in assault is the best way to go here. Alterac Pass is designed to be authentic to the WoW experience, with a unique Heroes of the Storm twist and, as such, there is sure to be plenty of fun and challenge involved when devising strategies to dominate this new battleground. Fans looking to squeeze even more content out of this Heroes of the Storm update are in luck, as alongside the new hero and battleground is an all-new event, featuring new quests and free rewards for all players. 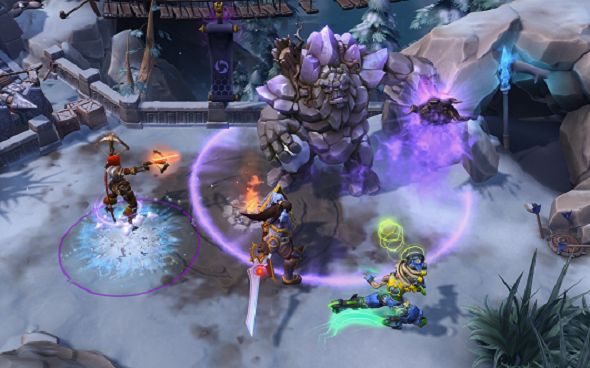 At the start of the event, each player can choose a side – Alliance or Horde – and proceed down a branching questline that will reward unique loot. Fans can also score some more loot by simply playing as a Warcraft hero (for a minimum of four games), including a guaranteed free Warcraft hero. Not happy with your result? Cash in some of your gold to reroll. Each loot chest will contain four drops as usual but one of them is guaranteed to be a warrior from the Warcraft universe, from a pool of 28. Achieve 50 tickdowns and you can also nab a unique Ram or Wolf portrait, while playing six games with friends will net you a sweet new banner. The final step to the questline is to win eight games as your Warcraft hero. Achieve this goal and you will receive a free Ram or Wolf mount. More tasty loot will be available throughout the Nexus, including Warcraft-themed skins, mounts, sprays, and more. More can be obtained via Echoes of Alterac loot chests and three event-exclusive bundles. Or, of course, you can craft them with shards. New skins themed after the Alliance and Horde will be on the way for existing heroes.